Rail cars off the track near Dubuque. Trains are moving again south of Dubuque as repairs wrapped up overnight following a weekend derailment along the Mississippi River. Twenty-six empty cars left the tracks that are close to several homes, but none of them were hit. The accident happened around 6:30 a.m. Sunday. Kerry Rogers, who lives next to the train tracks, spoke with KCRG-TV. “I was sound asleep and I just heard a loud crashing noise and it felt like an earthquake was hitting the house. The whole house shook,” Rogers said. No injuries were reported. Jeff Van Zile is happy the cars did not have anything in them. He told KCRG the trains traveling through the area are very careful. “They do go slowly through here. They have to honk their horns because there are several crossings here…for people to get to their homes,” Van Zile said. 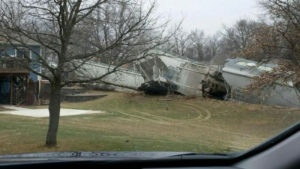 The Canadian Pacific train derailed near Massey Station Road, about 10 miles south of Dubuque. The train was bound for Sparta, Wisconsin. Canadian Pacific officials say the cause of the derailment is still under investigation. Photo courtesy of Terry Huseman.